(11th January, 1915 - 14th December, 1955). Founder member Special Air Services (SAS), Solicitor, Rugby Union International, Champion Amateur Boxer, Polar Explorer and Freemason. There are two sections to this profile on Bro. 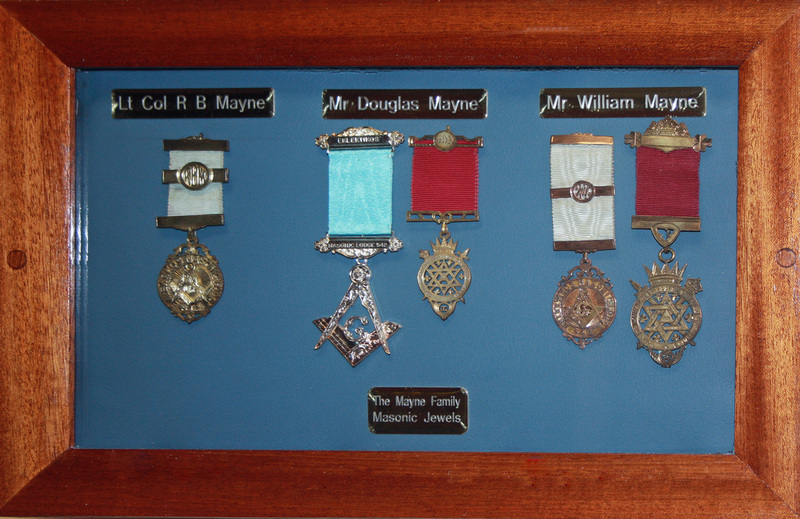 Mayne, firstly, a short biography on his life and secondly details of his and his family's involvement in Freemasonry. Lt Col Robert Blair 'Paddy' Mayne - a short biography. Robert Blair "Paddy" Mayne was born on 11th January 1915, five months after the start of World War I at Newtownards, County Down. He was the son of William Mayne and Margaret Boyle Vance. Margaret Boyle Vance was born in Holywood, Belfast, Ireland and died on the 25th February. 1956 in Newtownards. Margaret’s family originally came from Cumberland. Her grandfather, Gilbert Vance, was a linen merchant in Belfast. Margaret, who was described as ”a strong determined woman”, was alive in 1955 at the time of her son Robert Blair’s death. Throughout his life it was always to her that he turned for support. Robert Blair Mayne was named after his mother's cousin, Captain Robert Blair of the 5th Battalion. Border Regiment, who was killed in action the following year and awarded a posthumous Distinguished Service Order (DSO). 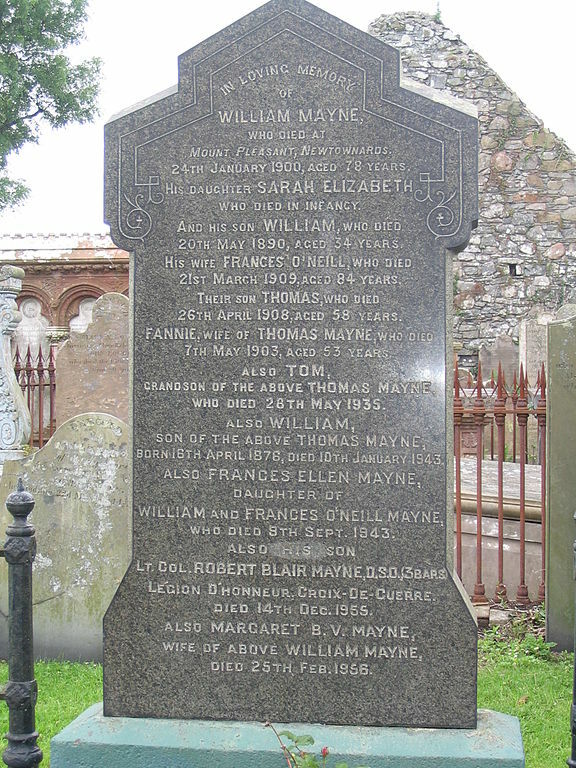 Mayne was from a Presbyterian family who had come originally from Scotland and settled in Northern Ireland early in the 18lh century. John Echlin Mayne, was born in 1781 on the Strangford Peninsula, of a Scottish Presbyterian family, who it is said was established there for a hundred years. It is not known which part of Scotland they originally came from. Robert Blair Mayne was one of seven children, with two older brothers, Thomas and William, a younger brother. Douglas, and three sisters, Molly, Barbara and Frances. 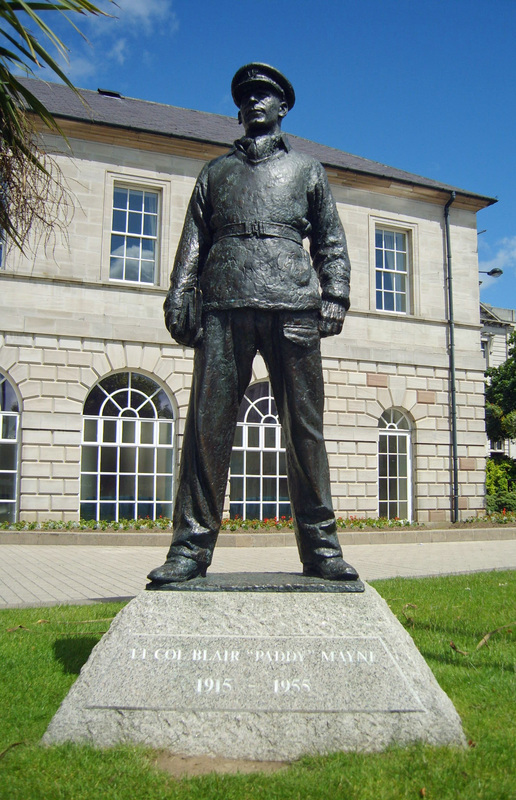 Mount Pleasant, Newtownards, County Down - former home of Blair Mayne. 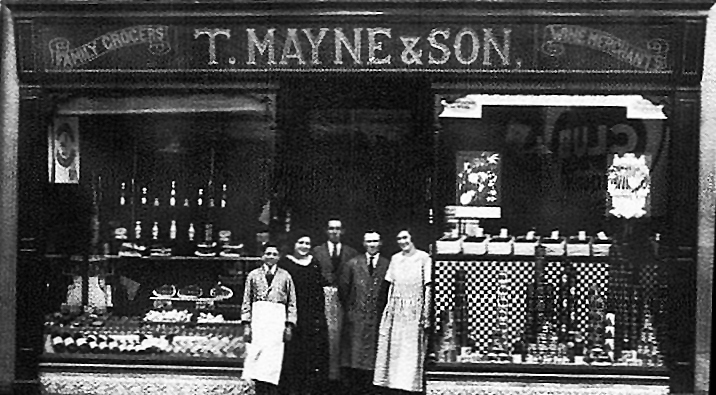 His great grandfather, William Mayne, established the present family home, known as Mount Pleasant, at Newtownards and began a wine and grocery business there, which was still flourishing when Blair was a boy. The business had passed to his Grandfather, Thomas and on to his father, William. His father was a successful businessman, owning property and running a retail business in Newtownards who continued to live at Mount Pleasant, a property set in around 41 acres of grounds overlooking the town. The property is no longer in the ownership of the Mayne family have been developed in recent years as a housing development. Douglas, Margaret Vance Mayne, William Mayne Snr. , William Jnr. (Billy) and his wife. He attended Regent House Grammar School. It was there that his talent for rugby union became evident, and he played for the school 1st XV and also the local Ards RFC team from the age of 16. While at school he also played cricket and golf, and showed aptitude as a marksman in the rifle club. On leaving school he studied law at Queen's University of Belfast, studying to become a solicitor. While at university he took up boxing, becoming Irish Universities Heavyweight Champion in August 1936. He followed this by reaching the final of the British Universities Heavyweight Championship, but was beaten on points. With a handicap of 8, he won the Scrabo Golf Club President's Cup the next year. Irish Rugby Team, 1938 - Blair Mayne is 3rd right on the backrow. Mayne's first full Ireland cap also came in 1937, in a match against Wales. 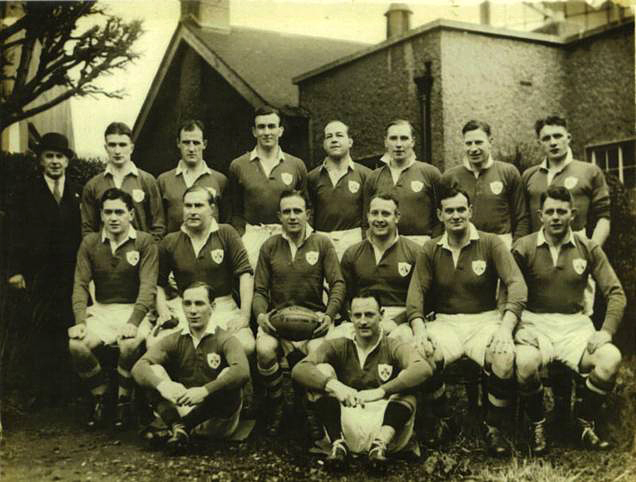 After gaining five more caps for Ireland as a lock forward, Mayne was selected for the 1938 British Lions tour to South Africa. While the Lions lost the first test, a South African newspaper stated Mayne was "outstanding in a pack which gamely and untiringly stood up to the tremendous task". He played in seventeen of the twenty provincial matches and in all three tests. On returning from South Africa he joined Malone RFC in Belfast. In early 1939 he graduated from Queen's and joined George Maclaine & Co in Belfast, having been articled to TCG Mackintosh for the five previous years. Mayne won praise during the three Ireland matches he played in 1939, with one report stating "Mayne, whose quiet almost ruthless efficiency is in direct contrast to O'Loughlin's exuberance, appears on the slow side, but he covers the ground at an extraordinary speed for a man of his build, as many a three quarter and full back have discovered." Blair Mayne - Queens University Rugby Team. Lieutenant Blair Mayne, No.11 Commando, 7 troop. It was after this particularly brutal and confused action, in which 130 officers and men, around a third of the strike force, were wounded or killed, that Mayne reacted violently against what he believed was the ineptitude of his Commanding Officer, whom he considered inexperienced, arrogant and insincere. Some sources state that Mayne struck him, and was awaiting court-martial and almost certain dismissal. However, his leadership on the raid had attracted the attention of Captain David Stirling who recruited him as one of the founder members of the Special Air Service (SAS). From November 1941 through to the end of 1942, Mayne participated in many night raids deep behind enemy lines in the deserts of Egypt and Libya, where the SAS wrought havoc by destroying hundreds of German and Italian aircraft on the ground. Following Stirling's capture in January 1943, 1st SAS Regiment was reorganised into two separate parts, the Special Raiding Squadron and the Special Boat Section (the forerunner of the Special Boat Service). As a major, Mayne was appointed to command the Special Raiding Squadron and he led the unit with distinction in Italy until the end of 1943. In January 1944 he was promoted to lieutenant colonel and appointed commanding officer of 1st SAS Regiment. He subsequently led the SAS with great distinction through the final campaigns of the war in France, Holland, Belgium, Germany and Norway, often campaigning alongside local resistance fighters including the French Maquis. taken in the desert near Kabrit, Eygpt in 1942. During the course of the war he became one of the British Army's most highly decorated soldiers and received the Distinguished Service Order with three bars, one of only seven British servicemen to receive that award four times during World War II. Mayne pioneered the use of military Jeeps to conduct surprise hit-and-run raids, particularly on enemy airfields. By the end of the war it was claimed that he had personally destroyed 130 aircraft. 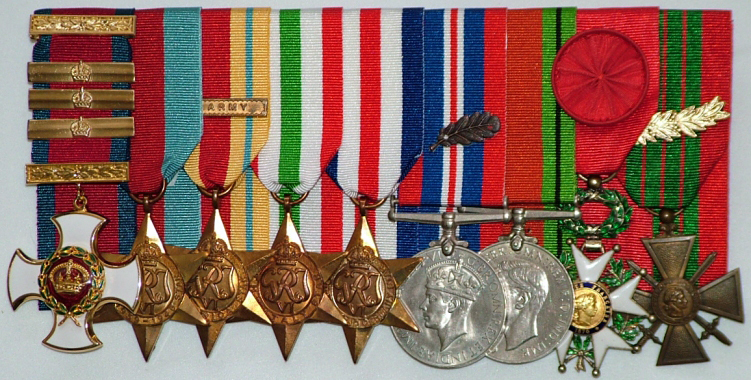 Medals of Lt Col Robert Blair 'Paddy' Mayne. In recognition of his leadership and personal disregard for danger while in France, in which he trained and worked closely with the French Resistance, Mayne received the second bar to his DSO. Additionally, the post-war French Government awarded him the Legion d'honneur and the Croix de Guerre, the first foreigner to receive such a dual honour. It has often been questioned why Mayne was not awarded a Victoria Cross, and even King George VI was to express surprise at the omission. The answer almost certainly lies in Mayne's abrasive attitude to some of his superiors, combined with the Army hierarchy's askance view of the unconventional attitudes and tactics of the special forces. In 1945 Mayne was recommended for a VC after single-handedly rescuing a squadron of his troops, trapped by heavy gunfire near the town of Oldenberg in north-west Germany. After the squadron became pinned down and sustained casualties, Mayne rescued the wounded, lifting them one by one into his Jeep before destroying the enemy gunners in a nearby farmhouse. However, although the VC recommendation was signed by Field Marshal Bernard Montgomery, commander of the Allied 21st Army Group, Mayne instead received a fourth DSO. 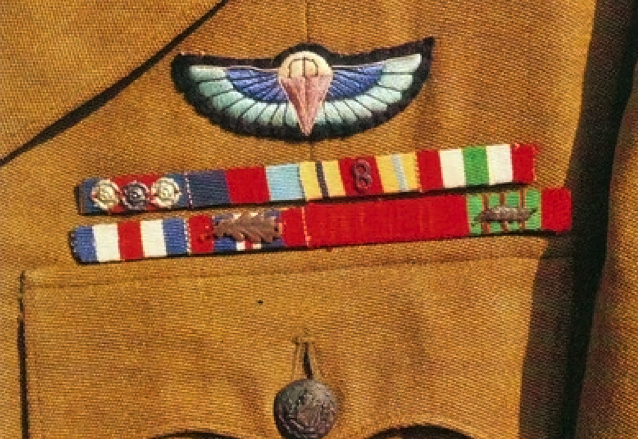 On his medal card you can see the letters 'VC' have clearly been crossed out. You deserve all the more, and in my opinion, the appropriate authorities do not really know their job. If they did they would have given you a VC as well. Please do not dream of answering this letter, which brings with it my sincerest admiration and a deep sense of honour in having, at one time, been associated with you. Inspection of troops at Bergen, Norway on the 28th July, 1945. After a period with the British Antarctic Survey in the Falkland Islands, cut short by a crippling back complaint that had begun during his army days, Mayne returned to Newtownards to work first as a solicitor and then as Secretary to the Law Society of Northern Ireland. Suffering severe back pain, which even prevented him from watching his beloved rugby as a spectator, and ill at ease with the mundanity of post-war life among provincial lawyers, Mayne became reserved and isolated, rarely talking about his wartime service. On 13th December, 1955, aged 40, he had been drinking and playing poker in a pub not far from his home in Newtownards. He later left, and went on to a friend's house where he drank some more. He drove homewards in his Riley sports car at 4am. The car collided with a parked vehicle just a short distance from his home. The town of Newtownards came to a standstill and his death was mourned across Northern Ireland. “Lieutenant- Colonel Robert Blair Mayne, DSO, was killed yesterday in a motor car accident near his home at Mountpleasant, Newtwonards, County Down. He was 40. The son of the late William Mayne, he was educated at Regent House School and Queen’s University, Belfast. He played Rugby for Queen’s and was later capped as a forward in six international games between 1936 and 1938, and in the latter year he was a member of the British team which toured South Africa. He also won the amateur heavyweight boxing championship of Northern Ireland while a student at the university. He qualified as a solicitor, and at the outbreak of war in 1939 joined the Royal Artillery, transferring later to the Royal Ulster Rifles. 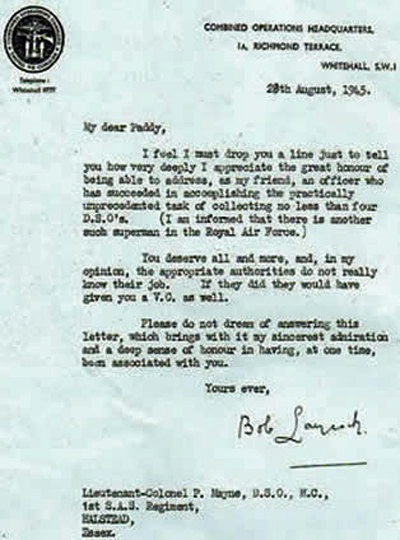 Later he commanded the Special Air Service, formed by volunteers in North Africa in 1941, the members of which were dropped behind the German lines after D Day. In 1997 a statue was erected outside Newtownards Town Hall. The statue was dedicated in the presence of a large guard of honour from 21, 22, and 23 SAS. I think it is fair to say that Lieutenant Colonel Robert Blair 'Paddy' Mayne, DSO, Freemason, was the personification of the word 'hero'. 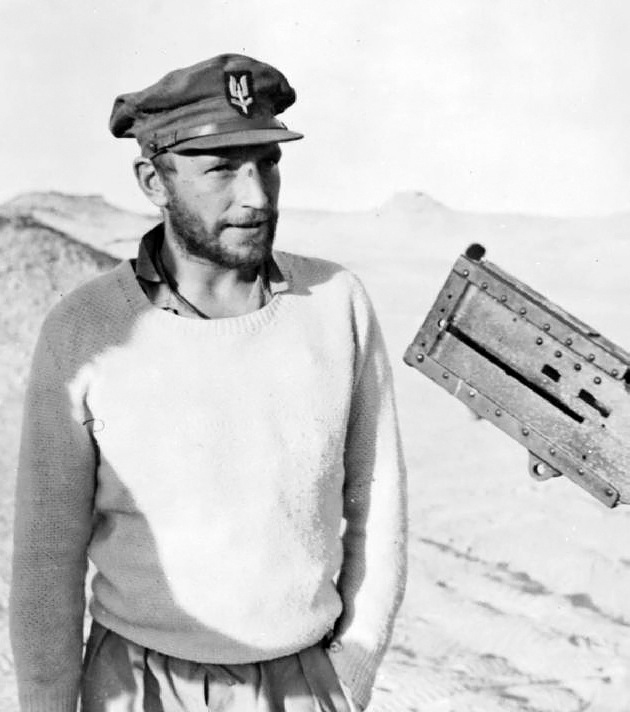 Robert Blair 'Paddy' Mayne ~ Freemason. Wiiliam Mayne received his second degree on 16th February 1905 and his third degree on 16th March 1905. He joined 'Friendship' Lodge 447 in 1911 and was a founding member of Eklektikos  Lodge No. 542 on 24th June, 1922. William mayne was the Founding Junior Deacon of Lodge No. 542. The congestion at the Lodge Meetings in Lodge No. 447, owing to the influx of new members, led to the formation of this new Lodge, Eklektikos No. 542. This Lodge, at that time, was intended for Past Masters and Senior Master Masons only, and no candidates were to be initiated, only affiliations were to be considered, so that the mother Lodge 447, might not suffer any financial loss in regard to Initiation Fees. It was to be a meeting place for older members who might wish to talk over the glories of bygone days. Reproduced courtesy of Ars Borough Council . He was also a member of Royal Arch Chapter No. 447 from 19th October, 1909. He died in 1943. As staed above it would have been no surprise that Blair (and his younger brother, Douglas for that matter) would have joined the Order. His father had joined in 1904. Blair Mayne probably would have joined much earlier but a little matter of World War II got in the way. In fact he membership of the Order was delayed to such an extent that his father had died some two years before he joined one of his father's former Lodges. Robert Blair Mayne joined Eklektikos Lodge No. 542, Newtownards on 25th September, 1945. He got his second degree on 28th May, 1946 and his third degree on 24th September, 1946. When he joined the Lodge his profession in the vocation column was listed as 'Army'. As can be seen from the partial reproduction of the Past Master's List of Eklektikos Lodge No. 542 below, he was Master of Lodge No. 542 in 1954. He was also a member of Lodge No. 447, Newtownards from February 1948, however at this time his profession is given as Solicitor. The Past Master's Jewel of Robert Blair Mayne. J. Douglas Mayne, was Blair Mayne's younger brother. Like his more famous sibling he also served in the Armed Forces during World War II. 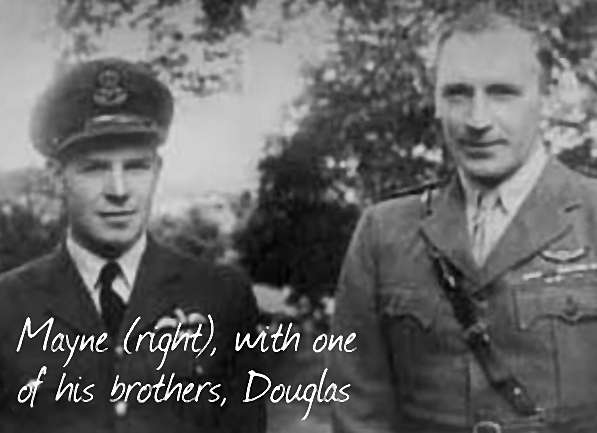 As you can from the photograph of Douglas and Blair below, he is wearing the uniform of the Royal Air Force. He joined Eklektikos Lodge No. 542 on 27th April, 1948. He got his second degree on 28th September, 1948 and his third degree on 23rd November, 1948. He resigned from this Lodge in 1981. When he joined the Lodge his profession was listed as Dentist. 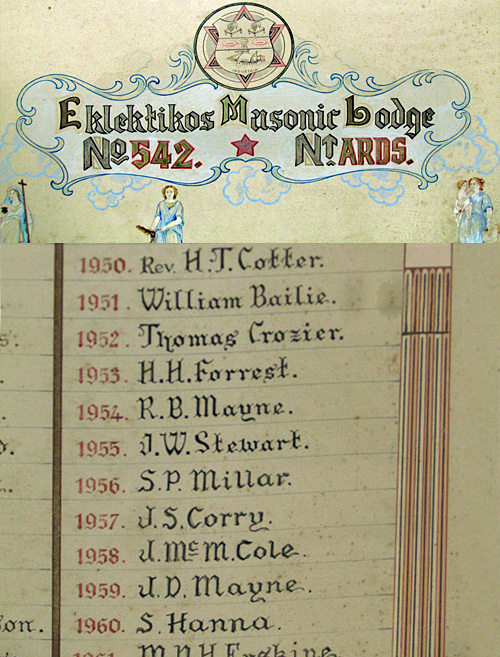 You will also see from the partial list of Past Masters of Eklektikos Lodge, produced above, that he was Worshipful Master in 1959. As did Blair, he joined Friendship Lodge No. 447 on the 11th September, 1956 however he resigned in 1970. He was also a member of Royal Arch Chapter No. 447 from 11th November, 1956. He resigned from the Chapter in 1970. As did Blair, he joined Friendship Lodge No. 447 on the 11th September, 1956 however he resigned in 1970. He was also a member of Royal Arch Chapter No. 447 from 11th November, 1956. He resigned from the Chapter in 1970.
in the offices of Ards Borough Council. The word comes from the Greek "ἐκλεκτικός" (eklektikos), literally "choosing the best". Whereas the original obituary appeared in the Times I have reproduced the text from "LEGENDARY WARRIOR OF THE SAS, Lt. Col. ROBERT BLAIR MAYNE, DSO" by John O'Neill who penned the book to support the charity 'Resolution', which was formed to support Veterans, TA and Reservists struggling to reintegrate into a normal work & family life because of military post traumatic stress suffered as a result of service in the British armed forces. This excellent book can be purchased as either an eBook or a paperback edition through the following link "LEGENDARY WARRIOR OF THE SAS, Lt. Col. ROBERT BLAIR MAYNE, DSO" by John O'Neill. Irish Masonic History would like to express its gratitude to the Mayor and staff of Ards Borough Council, particularly Ursula Mezzi and Susan Senior, for their permission to attend the Council Offices in Newtownards to photograph the Mayne Family Masonic Jewels and the portrait of Blair Mayne in uniform, which appears at the start of this webpage. The Jewels and photograph are displayed in the Mayor's Parlour.